The world didn’t end in December. That’s no excuse to be unarmed for the future! No matter who you are, we have the workouts to take your bis, tris and grip to new frontiers of size and strength. Let's get straight to the heart of the matter. Arms aren't just another part of your physique. They're crucial to your credibility. You can squat, deadlift, or plank until you collapse, but when your grandmother, your little brother, or your potential new amour wants to know how much you've been "working out," they reach right for your sleeve—and you flex. And why shouldn't you? Full, powerful upper arms and steely forearms aren't just there for opening jelly jars and giving crippling handshakes. They're the calling card of the undeniably ripped—the singular goal that drew most of us to pick up our first dumbbell, or to finally wander off the treadmill and into The Pit. This is where the "building" in bodybuilding begins. If your arm workout hasn't changed since you were a spindly tween, you've got some serious catching up to do. This year's installment in ARM-ageddon, our annual salute to bis, tris, and forearms, is all about taking things up a notch. If your biceps are strong but not as thick or peaked as they should be, we've got the head-specific workouts you need. Weak grip holding back your big lifts? You're covered. Are you a woman ready to drop the color-coded dumbbells and up the ante? Let Jen Jewell be your guide. And because it all began with eye-popping arms, we've got a classic workout from the deacon of the preacher bench, Larry Scott, who still packs world-class guns into his 70s! Don't cover your arms with sweaters and T-shirts. Have the confidence to bare your arms! Here's the workout that will help you do it. Biceps are the original two-headed beast. Make sure you're feeding both halves of yours with a complete array of curls. The Golden Age of Bodybuilding began when Larry Scott stepped on stage at the first Olympia. Are you up to the challenge of the classic workout that got him there? Quit fooling around with those toothpicks above your wrists. Give forearm training its due and bring your forearms to the forefront. A strong grip is good for more than opening pickle jars. Work some forearm tools into your existing program, and your reward will be greater overall strength. If your biceps and triceps are fine just the way they are, stick with your workout. 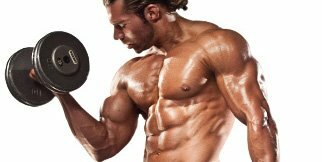 For the rest of you, here is the launch sequence for skyrocketing your arm growth.